One of the Winnipeg Blue Bombers’ most outstanding and reliable defensive forces to ever dawn the Blue and Gold has decided to hang up his cleats. Doug Brown, an 11-year Canadian Football League veteran who played every one of his 188 career games with the Blue Bombers, announced his retirement at Canad Inns Stadium Wednesday afternoon. The New Westminster, British Columbia native kick-started his CFL career 2001 after originally being selected fifth overall out of Simon Fraser University in the 1997 CFL Draft by the Calgary Stampeders. After four years in the NFL with the Buffalo Bills and Washington Redskins, Calgary traded the 6-foot-8, 290-pound defensive tackle to the Blue Bombers after he missed the 2000 season due to injury. Despite never capturing a CFL Championship, with Grey Cup appearances in 2001, 2007, and 2011, Brown’s Hall of Fame credentials cannot be overlooked. The CFL’s Most Outstanding Canadian in 2001 was named a divisional all-star eight times (2001-2002, 2006-2011), a CFL all-star seven times (2001-2002, 2006-2010). 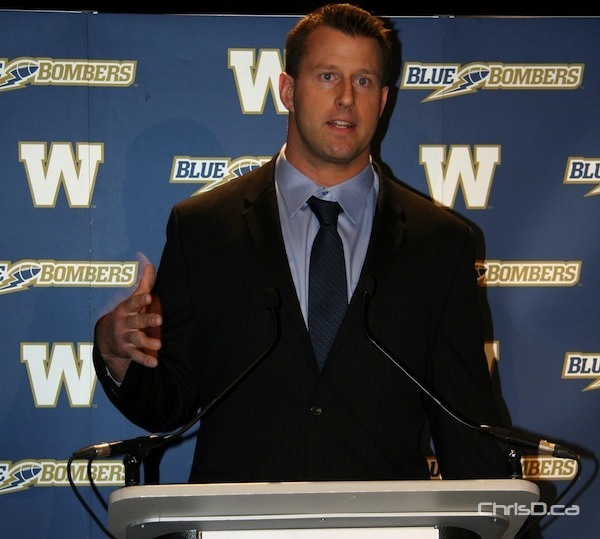 Brown sits second all-time among Winnipeg Blue Bombers with 429 career tackles, and third all-time with 52 quarterback sacks. Even with the capture of all the individual accolades a professional athlete could hope for, Brown tributes his career achievements and retirement decision to a man he and his teammates lost tragically in July of this past year. “I met Richard Harris (defensive line and assistant head coach) in 2002,” Brown said. “2006 was the first year we were able to work together. I have to say 2006, 2007, 2008 were probably the three best years I had as a professional athlete, NFL or CFL, and that was all due to the handiwork of this gentleman.